Yesterday morning. It's finally beginning to look and feel like Winter. Had a good time at Georgetown's Winter Market yesterday, reading a couple of poems as part of the Colorado Welsh Society performances. Winter itself caught up with us last night -- a bit of snow, and quite cold today. ...they made their way to their winter indoor habitat, following their good friends the cyclamen and the rosemary. Usually this happens in November, but the relatively mild weather has allowed them to remain in their summer home longer than usual, soaking up sunlight. But with sub-zero (F!) temperatures forecast for Sunday night, it was time for the move. Long may they flourish in their winter home! 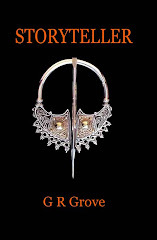 I've just set up a new hardcover (w/ dust jacket) version of Storyteller on Lulu. Same text except I upgraded the map in the front. I'm going to do the same thing for the other books this week. Lulu, btw, is currently running a pre-Christmas 20% off promotion on everything, good through the 14th. ...and things have been busy. First off, The Druid's Son is now showing as "in stock" on amazon.com, and has three reviews from early readers. Take a look! Saturday I spent in Cheyenne at the SCA's Hunter's Feast - great food as usual, and no snow this year. It was good to see old friends, and I had fun performing a brief extraction from the next Storyteller book in the bardic competition. All told, an enjoyable day. Sunday and yesterday went in miscellaneous activities, including book bins and updating inventory. Our next merchant event will be the SCA's Caerthe 12th Night January 5th. I've spent some time looking at the manuscript to date of the next book, and contemplating philosophical issues, e.g. 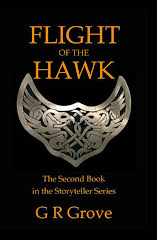 how closely to Togi's experiences have to match what Gwernin hears as stories 500 years later? Should I even try to make things match up in any detail? And what will readers of the two series think if they don't? The mild weather continues - usually by now we've had some snow and very cold weather, but I'm not complaining. (No, it's not "global warming", it's just the South Pacific "La Nina" oscillation.) This is the first time in three years the weather has been good enough to drive to Cheyenne for this weekend's event. There's a bardic competition scheduled, and hopefully I'll sell some books as well. Something new for the garden which I got a couple of weeks ago. Still haven't decided where to put it. The seasons turn; with Samhain, the dark half of the year begins. Yet even while the creatures of the earth prepare for their winter rest, this writer is preparing for new work. Yes, it's time I got back to the continuing adventures of Gwernin Storyteller, and the book I laid aside last year to write The Druid's Son, now called The Fallen Stones. Books can take a long time to germinate, but this one is at least partly written, although some of it may have to be changed a bit. However, my goal is to have it finished and out within the next year. All I will say about the story right now is that it begins with a death and ends with a birth, and much of it takes place in Ireland. Oh, and the first words are: "Taliesin sang it, so it must be true." It feels strange not to be writing or proofreading; I'll have to start another project soon. In the meantime, I'm looking for reviewers, and cleaning house (long overdue), and doing autumn cleanup in the garden. We've been having another run of warm weather, common this time of year, but it probably won't last much longer. A cat picture today: Titus waiting by the cold frame for his fresh catnip (inside the wire cage you can see next to him). We'll see what's left when it melts off - which it's already doing - but I think I can safely say that summer is over. A little more book news: Smashwords has cleared The Druid's Son for premium distribution, which means it should show up on Barnes & Noble, Sony, and Apple in a couple of weeks, possibly sooner. This is very fast turn-around; clearly I did a good job with my formatting. Now that I'm (momentarily) not writing, it's time to tend to all the other stuff which accumulated. Garden cleanup is one item, and it's a beautiful day out there (so why am I in here typing?). Time to pick the last of the veggies, since it looks like we may be getting a killing frost soon (Friday night, maybe!). Updated the graphics and ordered the first hard-copy proof to see how they look. There will certainly be at least one more proof round after I get the rest of the proofreaders' feedback, but in the meantime this will let me see what else (if anything) I need to change. Proof copies are also useful as ARCs for reviewers, so it's not a loss. The printed version will also have the bar code, isbn, etc in the lower right hand corner. After a couple of days off, I've been back at work on the new book. The proofreaders are busily reading, and so far only finding minor typos. Today I finalized the back cover, and have uploaded the project onto Lulu, pending final revisions of the text file. As soon as I get that, I'll order the first proof copy. Next comes the text reformatting for the e-books on smashwords and the process of feeding that through their converter - say another week, all told. If all this goes well, I should have pre-release copies for reviewers before the end of October! The second draft is finished and has gone to the proofreaders. 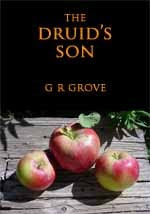 At this rate I should have the e-book version of The Druid's Son out by Samhain, and the hard copy available before Christmas, on Lulu if not on Amazon etc. Still a lot of work to do, though - finish the map and the other front matter (copyright page, etc), incorporate whatever changes the proofreaders find, finish the back cover design, reformat everything for the e-book version, tweak the hard copy version and get it uploaded to Lulu... etc, etc, etc! Oh, and work on finding reviewers and doing other publicity stuff. Behind on blogging again, but I've had some distractions. After a few days off, I've started on the second draft of The Druid's Son. Not really rewriting anything, just changing a word here or adding a phrase there. I'm also making a list as I go of things to check, change, add, explain, etc. I don't think I have any major loose ends, but there are a few threads here and there which I think need to be developed a little more or tied off more securely. So far, though, things are looking good. When I finish this draft I'll pass it on to a couple of friends who've offered to proofread it for continuity, clarity, typos, etc. While they're doing that I'll finish the map(s) and the back cover. 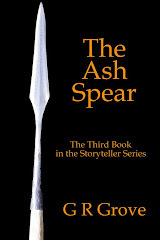 Then it'll be time for a final draft, and a e-book friendly version to upload to smashwords. After that I'll work on getting it through Lulu and on Amazon etc. I'll also be looking for blog reviewers at that stage. All in all, still plenty of work to do, but the e-book at least should be out before Christmas, and perhaps proof copies of the paperback as well! Garden picture today: pumpkin-squash hybrid (they're cross-fertile, so growing them close together results in some strange fruits sometimes). You can see a normal dark green immature pumpkin in the background, but this fellow has been yellow from the beginning. Been doing too much writing in the last week to blog. I'm at 92,386 words and 17.5 chapters - 88% completion of the first draft. Not much today due to some other stuff, but full speed ahead again tomorrow. Last pieces of the plot are coming together - just have to grind it out! Garden picture from a couple of days ago... yes, we have beans now! Not much actual writing since Friday, but a good bit of looking at maps and reference books and thinking. Conclusions: we know very little about Britain in this period (other than what Tacitus has to say); we know even less about British Druids (i.e. they may have existed, and if so were probably on Anglesey at some point in the 1st century AD, but we have no idea what they were doing there); and we know rather less about Ireland and Irish Druids (if any). Ireland was where it is today; there was some sort of (probably complex) "Celtic" society there, speaking (probably) a Godelic language; there were probably religious / magical specialists of some kind (who may or may not have called themselves Druids) in that society at the time in question; there is a possibility (supported to some extent by archaeological discoveries of Roman material) that Agricola may have sent some sort of military expedition to Ireland, most probably in late 81 AD, with outcome unknown; if he did send such an expedition, they most probably crossed from the vicinity of Galloway (Scotland), as he was operating in that area at that time with the required manpower and naval support; Agricola (according to Tacitus) had in his entourage at that time an exiled Irish noble of some sort who could have served as a focal point for such an expedition. What any Druids (if they existed and were interested) might have had to do this is entirely conjecture. It's a good thing I'm writing fiction. Almost missed blogging again today - too busy writing. Passed 80,000 words - almost 80% complete for the first draft. The last week has been busy. Miscellaneous stuff Monday and Tuesday, writing like crazy Wednesday, Thursday and Friday; our private Lughnasadh celebration Friday night; and Saturday and Sunday at the Highlands Ranch Scottish Festival with the Colorado Welsh Society. Today, trying to get back on track with writing. I've done over 5,000 words in the last week and hope to keep to that pace! Today's picture: a group of oak trees on the U of U campus in Salt Lake City, where I was on the Cymdeithas Madog Welsh Course two weeks ago. Hot dry weather continues, but the garden is doing fine - as long as I keep it watered. I picked my first eggplant yesterday - one of the long Japanese kind I like. About eight inches long, nice and tender. I had to move one of the potted tomato plants, because one of the squirrels was picking the tomatoes - bad enough that he ate the ripe one, but picking green ones and then throwing them away is too much. We've had a minor plague of Japanese rose beetles, so I've been patrolling the garden looking for them two or three times a day. In the absence of roses, they seem to like Virginia creeper, so I've been pursuing them there to thin out the population. No spraying - eco-friendly methods only (except to the beetles). Not much writing over the weekend due to one thing and another, but I'm hoping to make up for it today. Over 68,000 words and 178 pages now. Onward! Weather continues warmer than average, but not as bad as it was in June. Squirrels ate half the flowers off my zinnias yesterday and stole my first decent sized ripe tomato. There are a lot more of them around lately (squirrels, not tomatoes) - probably this spring's youngsters being turfed out by mom and looking for handouts. There have also been continued signs of raccoons, although they currently seem to be waiting for the honey crisp apples to get a little riper... Squirrels, however, don't put corn in the birdbath. Raspberries are about finished, but were wonderful while they lasted.One bean stalk has reached the top of the netting - over six feet up - and I expect to start harvesting green beans in two to three weeks. There's also a female flower on one of the yellow zucchinis. Summer gardens make up for the hot weather! Not much writing yesterday, because I was playing with maps, partly because of story matters and partly to start preparing the illustrations for the book. One of the ones I need almost overlaps the North Wales from The Ash Spear - almost, but not quite. Sigh. So I'm drawing a new one... Just to make things clear, in case they weren't, the book I'm currently working on is the prequel set in 60-80 CE, called The Druid's Son. The next Storyteller book (#4), which I hope to have out late next year, will be called The Fallen Stones. Today more writing and less drawing, I hope. Onward! Well, the re-writes are over, at least for now, and I can go forward. The last patch is still a bit rough, but I can deal with that in the second draft if necessary. It feels quite liberating to be looking at what amounts to a clean page before me, and only a general idea of what I'm going to write to fill it. We had some better weather yesterday afternoon - clouds and a few light sprinkles, which cooled things down nicely. Hot again today, but tomorrow is supposed to be better. We'll see - they've been wrong so many times lately that my expectations are not high. Not much new in the garden, although I planted some marigolds yesterday in spots where the peas had been. Too warm to go out and take a picture, so here's a different one from last week instead. There's now a three inch long cucumber under the leaves at the left end of the picture. Another hot weekend, especially yesterday when we didn't get any afternoon clouds. The next few days are supposed to be a bit better - we'll see. What we need most is our usual early July "monsoon" - tropical moisture coming up from Mexico to give us regular afternoon thunderstorms. However, the garden's doing well. I'm still having red (and a few yellow) raspberries for breakfast as I do the early morning watering, which is pleasant, and the mosquito population seems to be dropping off a bit (no rain...). The robins, black caps, and squirrels are finishing off the pie cherries - I don't try to pick anything above my reach, which leaves plenty for them. I've also seen house finches in the evening. The birdbaths remain very popular. Some of the largest sunflowers have started to bloom, which will eventually be popular with all of the above. Not as hot here the last couple of days, but the fire situation is still dreadful. Glad I don't live in the mountains or (especially) the foothills - all power and protection to the firefighters! Writing's coming along pretty well, too. I have almost finished the rewrite - just a couple of pages to go - and the manuscript now stands at 61,000 words and 160 pages. Milder weather definitely helps! Not a very productive weekend, as the hot weather continues. Denver has now set record highs (~102 F) for 3 (4?) days in a row, and it's not over. We also spent part of Saturday afternoon celebrating the Solstice with the local Druids in Cheeseman Park, where it was far too hot to be enjoyable. Almost finished the fill-in chapter for DS - hopefully I can finish it today before it gets too hot. MS currently stands at 59,660 words and 156 pages... 2400 words in the last week isn't bad, considering the interruptions. The last few days have been hot and busy. I got no writing done yesterday due to preparations for last night's Midsummer ritual, and have spent some of today trying to make up for it. One more episode to finish that chapter, and then onward. ...and already too hot. Denver set a new high temperature record yesterday, sigh. This will *not* help the firefighters trying to deal with the High Park fire. I got more writing done over the weekend, partly because it was too hot to exercise or garden yesterday. 1,682 words so far in the last week - not great, but there were some "zero" days in there, too. Total manuscript is 150 pages so far, which puts me around the half-way mark. Once I finish this fill-in chapter, I can move on to the last two rewrite sections - then forward! ...and then back to work. Some additional writing the last couple of days, but not much achieved in the garden due to the warm weather. Last night was the first summer meetup for our Welsh language group - more information on that blog. Still working on rewrites to bring the DS manuscript into alignment with the Celtic Calendar. This morning I'm alternating writing with mowing parts of the lawn, having finally got the wheel back on the lawnmower. Bought a lot of little plants at Cherry Creek farmer's market yesterday, and need to start getting them in the ground. The cucumber bed is ready, but I still need to finish digging the eggplant / pepper bed, which is behind because of the overwintered leeks... Leeks and something on the menu this week!